The public continues to express favorable opinions of a number of federal agencies and departments. And while positive opinions of the FBI among Republicans have slipped since early last year, two-thirds of Americans – including a majority of Republicans – view the bureau favorably. The public rates the 10 agencies and departments included in the survey more positively than negatively, with the U.S. Postal Service continuing to rank highest. Today, fully 88% of Americans say they have a favorable opinion of the Postal Service, compared with just one-in-ten who view it unfavorably. While more view the Department of Education favorably than unfavorably, just about half (53%) say they have a favorable opinion, while 42% have an unfavorable view – the highest share expressing a negative view of the 10 asked. Overall, by roughly two-to-one, most Americans give positive ratings to the CIA (64%), the Federal Reserve (63%), the Environmental Protection Agency (EPA) (60%) and the Department of Justice (59%). The survey, conducted Feb. 7-11 among 1,009 adults, finds that 66% have a favorable opinion of the FBI, while 23% hold an unfavorable view. While overall ratings of the FBI have changed little in the past year, the partisan gap in views today in opinions of the FBI is wider than in the past seven years. Today, the 23-percentage-point gap in views of the FBI among Republicans and Democrats is among the widest of the 10 agencies and departments asked in the survey: While 78% of Democrats and Democratic-leaning independents have a favorable opinion of the FBI, 55% of Republicans and Republican leaners say the same. There are wide partisan differences in ratings of the Internal Revenue Service (IRS) and the Environmental Protection Agency (EPA) as well. Half of Republicans (50%) are positive toward the IRS, compared with 68% of Democrats. On the EPA, 52% of Republicans say they hold a favorable view; 66% of Democrats say the same. Republicans (87%) and Democrats (90%) alike give strongly favorable ratings of the Postal Service. Smaller majorities across both parties say they have a favorable opinion of the Department of Justice (57% of Republicans, 60% of Democrats), the VA (56% of Republicans, 59% of Democrats) and the Federal Reserve (65% of both). Across a number of agencies and departments, views have shifted over the last year – especially among Republicans and Republican leaners. 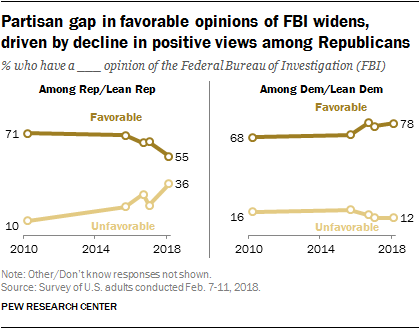 Most notably, while views of the FBI among Republicans are more positive than negative, the share saying they have an unfavorable opinion of the bureau has increased. Currently, 55% of Republicans and Republican leaners have a favorable opinion, compared with about a third (36%) who have an unfavorable view. Just one year ago, 65% of Republicans gave the FBI positive ratings, and only about two-in-ten (21%) said they had unfavorable views. Views among Democrats are little changed in recent years: A wide share (78%) is favorable toward the FBI, compared with just 12% who give unfavorable ratings. As a result, today, the 23-percentage-point gap in favorable ratings among Republicans and Democrats stands at its widest on record. 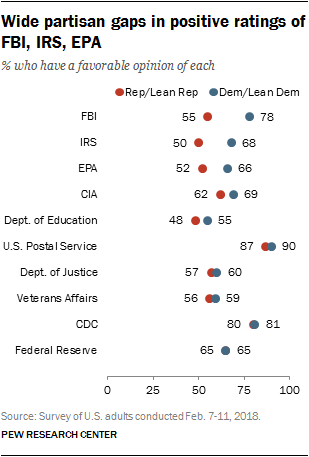 In attitudes toward other agencies and departments, the partisan gap has narrowed considerably, driven by more positive views among Republicans. Attitudes toward the Department of Justice have shifted considerably among both Republicans and Democrats. Today, about six-in-ten in both parties say they have a favorable opinion of the DOJ. Among Republicans and Republican leaners, a 57% majority are favorable today, up 10 percentage points from last year (47%). By contrast, the share of Democrats who view the Department of Justice favorably has declined from 74% to 60% since then. Republicans also are more favorable toward the Federal Reserve and the VA today compared with last year: Currently, about two-thirds of Republicans give a positive rating (65%) to the Fed, up from about half (51%) one year ago. And a 56% majority of Republicans view the VA favorably; last year, just 40% said the same. Views of these agencies among Democrats are little changed in the last year: Majorities continue to give favorable ratings for both the Federal Reserve (65%) and the VA (59%). Republicans also are more positive today than in the past toward the IRS (50% favorable, up from years past, when no more than about four-in-ten rated the agency favorably). By comparison, there has been little movement among Republicans – or Democrats – in views of the CIA.